The Leonids put on a spectacular display in the early morning hours of November 17th as seen from from Jacumba, California. Around 1:30 to 4:30 am PDT, we were treated to a barrage of meteors, from bright little spikes of light to radiant bolides that streaked halfway across the starry skies leaving long smoke trains that lingered in the air and then dissipated. The stream was sporadic however, and we noted several five to ten minute intervals with small counts breaking the 100-200 meteors per hour rate that seemed a good approximation to the average observed. I was certain that the rate was close to the 500/hr in periods between 3:30 am and 4:30 am predicted by some. Jacumba has very few bright street lights currently and the zodiacal light shone so brightly it was almost distracting. I decided to sketch the scene, and after finishing the foreground ridge on the eastern side of my property and the position of Leo on the horizon, I began to record the trajectory and brightness of the meteors that fell within the field of view of my sketch during the interval between 1:45 am and 3:15 am PDT. You’ll note that Leo would have risen about 25 degrees higher off the horizon during the sketch session, so the drawing does not accurately reflect that movement. Despite the restricted field of view, you can see that I was able to record a nice variety of Leonids during the hour and a half period. In the future, I’ve decided to try sketching one hour intervals with larger fov’s, that way I can record hourly count variations. I hope most of you had clear weather and were able to see this awesome event, it’s one that will remain in my memory as the best I’ve ever witnessed. Great depiction of the Leonids! I had all the right conditions to view the event including the hot chocolate but wasn’t sure how to render it into a sketch. I had that thought of including an expanse field of view but that would make the fiery granules very minute and probably not effective in how I wanted to portray them. I believe your method of sketching them in the future on a hourly basis not only shows a count/hour interval but also a panoramic vista can be used if necessary as the host constellation rotates giving different views. 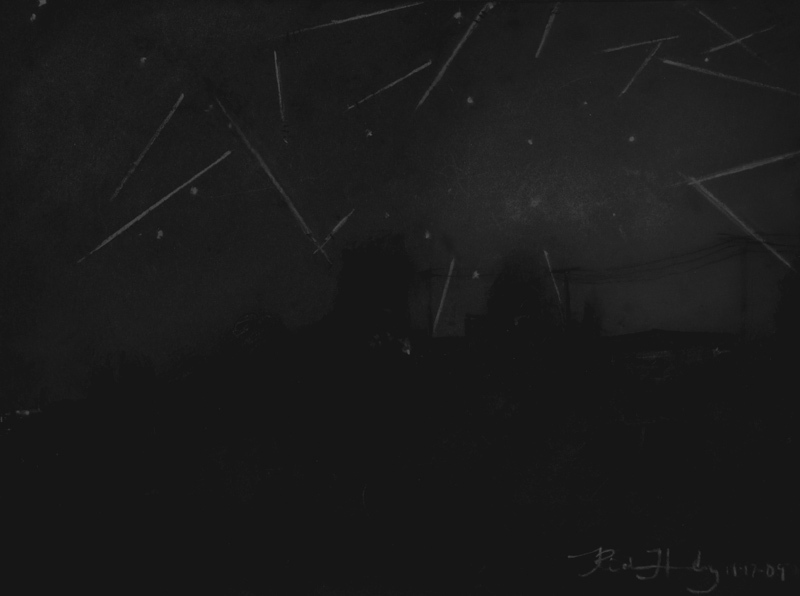 Again, thanks for the idea, perhaps the Geminids can prove to be sketchable. We are all very impressed. We are always very impressed.